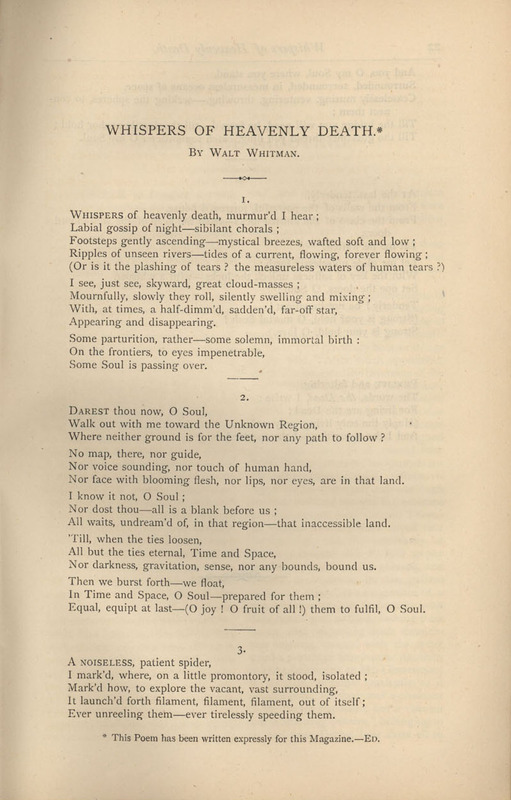 "A Noiseless Patient Spider" is a short poem by Walt Whitman, published in an 1891 edition of Leaves of Grass.It was originally part of his poem "Whispers of Heavenly Death", written expressly for The Broadway, A London Magazine, issue 10 (October 1868), numbered as stanza "3". It was retitled "A Noiseless Patient Spider" and reprinted as part of a larger cluster in Passage to India (1871). The poem's most prevalent literary technique is imagery; it is difficult to find even one line that does not contain a vivid image. The first, and one of the most important, examples occurs on the first line: “A noiseless patient spider.” This visual image brings pictures of a small, perfectly still, spider sitting in its web. 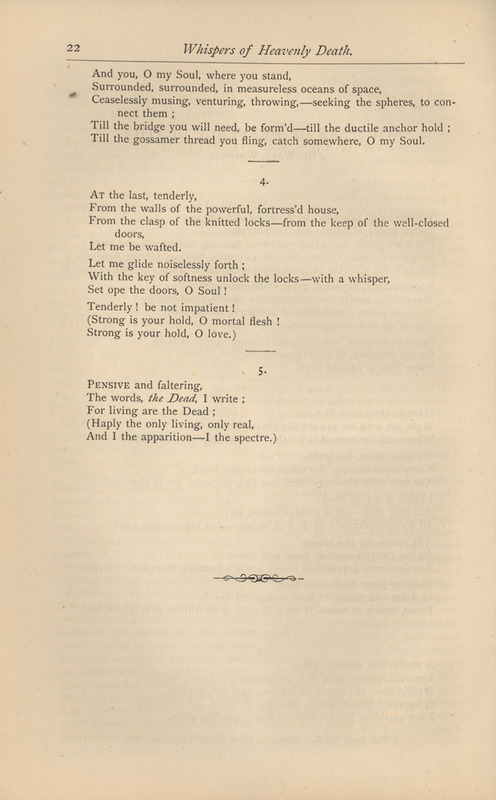 The image of the motionless spider, completely alone and isolated, as painted in the first three lines of the poem introduces the idea that the speaker feels alone in the world. The image of the “vacant vast surrounding” hints at the speaker’s possible doubts about the meaning of life. If the spider is the speaker’s soul, then the surroundings should be the rest of the universe, and if the rest of the universe is empty with nothing for the filaments to connect to, then what is the purpose of “tirelessly speeding them” on? The parallel image found on line eight and nine, “surrounded, detached, in measureless oceans of space, ceaselessly musing, venturing, throwing, seeking the spheres to connect them”, is a definite reference between the spider's condition and the speaker's. Both the speaker and the spider seem incapable of finding meaning in the universe. However they both keep trying, either out of hope or blindness. ↑ "Whispers of Heavenly Death. "* The Broadway, A London Magazine 10 (October 1868): 21-22. "* This Poem has been written expressly for this Magazine.—ED."